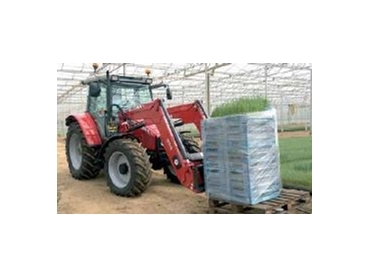 This range of tractor implements from Massey Ferguson includes a powerful fork plus pallet forks with optional accessories. These tractor implements are specifically designed to take the demanding loads and wear and tear of the jobs they are built for. This is a perfect all-round silage tractor implement, suitable for everything from shovelling manure and other materials to loading diet feeders. Its various design features make it an efficient working tractor implement. It is available in seven widths: from 130cm to 250 cm. These tractor implements can be specified with either: 97 cm forks (1000 or 1600 kg capacity) or 120 cm forks (2500 kg capacity). Manufactured in one piece, the upper profile is able to be adjusted laterally to suit the load, which is distributed over a large area thanks to the wide load-bearing surface. This provides a very stable fork with immense strength. Spike attachments or top grabs can be fitted as optional extras. The tines on these forks are fitted prior to painting, and secured with a very high torque. These tractor implements are manufactured with a specially hardened box section. Manure forks have a long service life. They are available in three widths: 130 cm up to 170 cm.